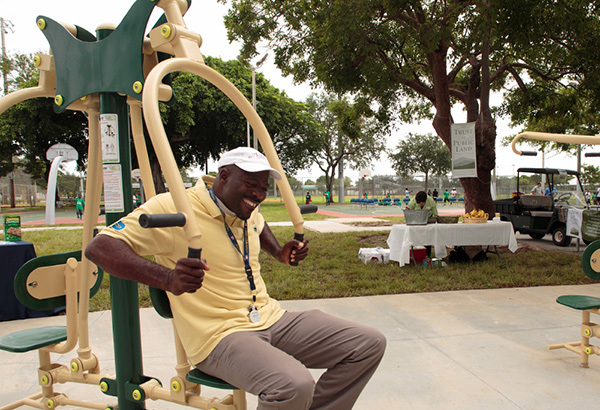 In July 2012, we opened our first Fitness Zone® installation in Miami-Dade County at West Perrine Park with funding provided by MetLife Foundation, Health Foundation of South Florida, and The Miami Foundation. Obesity and related health problems are a leading preventable cause of death in America. But for many people, gym membership fees are a barrier to getting in better physical shape. The Trust for Public Land has been working to bring Fitness Zone® programs to parks across the nation, creating a fun, accessible, and social environment where people can enjoy getting fit. The equipment is similar to machines in a private gym but is more durable to resist weather and vandalism. Since 1972, The Trust for Public Land has protected more than 3.3 million acres and completed more than 5,400 park and conservation projects.